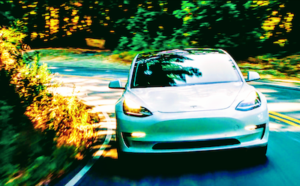 Tesla Model 3 Owners Club Deep Dive Into The Tesla Model 3 (Part 1) — Hot! 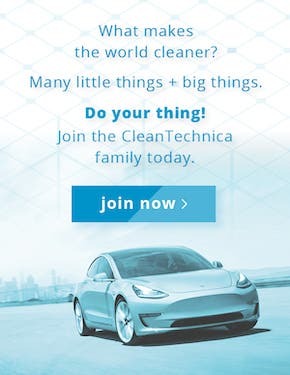 Trevor Page of the Model 3 Owners Club contacted us here at CleanTechnica a few days ago to say he and YouTube co-host Kenneth Bokor had secured the use of a Tesla Model 3 for two days. They were free to drive the car, probe its intricate bits inside and out, photograph it, take videos, and measure things. They sent over a 1 hour and 10 minute video of the details. 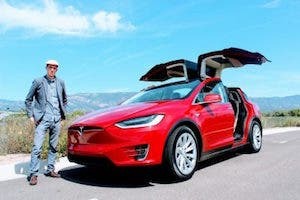 The only restriction put on us was that we could not share the video or embed it into a story until after Tesla announced that regular production of the Model 3 had officially begun. Naturally, we agreed to Trevor’s terms and conditions. Well, we haven’t yet seen word of Model 3 regular production beginning, but we have gotten approval to share the video and write about it. 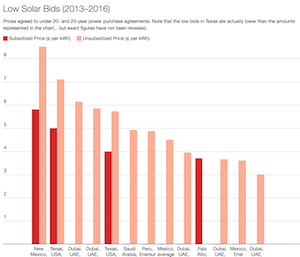 Check out the video below, and read our reflections and summaries in this article and two coming articles from Kyle Field and Zach Shahan. 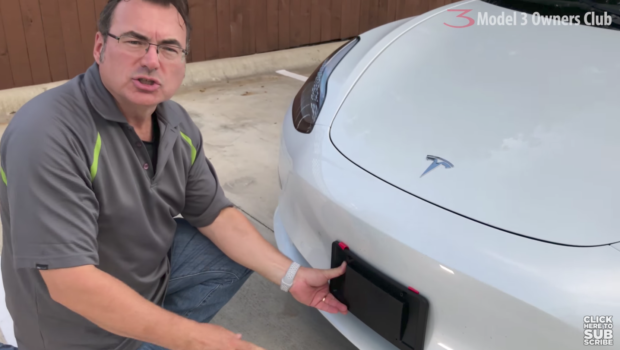 If you have a Model 3 on order or are thinking of reserving one, Trevor’s video is the most comprehensive and accurate source of information about the car available to date, unless you actually having one parked in your own driveway. Trevor and Ken began at the front of the car and detailed every part of it inside and out all the way to the back bumper. They took careful measurements, tested all the controls, measured interior dimensions, sat in the seats, and stared out at the outside world through the panoramic glass roof. They even took video footage of the underside of the car. Basically, they looked in every nook and crannie and captured it all in high definition. For our report, we have broken the story down into three sections. The first (this one) deals with the exterior and some of the interior of the car. Next, Kyle will walk you through some more of the interior details and the intricacies of the touchscreen. Then, Zachary will cover some remaining exterior + interior notes as well as the ride & drive portion of the Model 3 video. 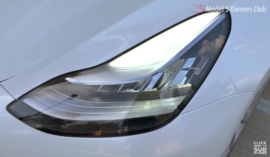 The first bit of news is that the LED headlights (@2:34) have the bulbs recessed into the top of the housing and reflecting forward via a mirror. Interesting. Later in the video, Trev and Ken show how the headlight alignment can be adjusted by the owner from the touchscreen. The front fascia of the car sits about 8 inches above the pavement and has aerodynamically designed air ducts built in to direct cooling air to the front brakes (@3:15). Then the lads move on to reveal the cleverly disguised roof rack attachment points (@3:36) and windshield wipers (@4:26), including the washer jets incorporated into the wiper arms. Over the next 60 seconds, they go into detail about how the outside and inside door latches work. 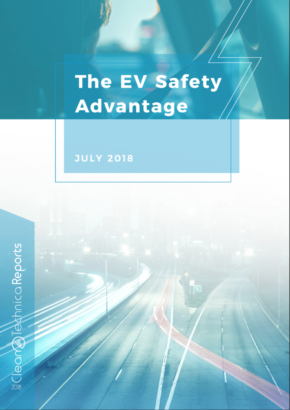 The electronic door poppers are conveniently mounted high in the armrests, but there is a mechanical pull embedded in each arm rest to open the doors from the inside in the event of a power failure. All interior surfaces are covered in soft synthetic Alcantara suede. At the 9:30 mark, Trevor and Ken dig into the dimensions of the trunk, which measures 42 inches wide and 19 inches high at the rear crossbar. The trunk depth to the back of the rear seats is 42 inches. The lads were easily able to stow several suitcases in there, plus there is room for a medium-size duffel back under the floor. The trunk lid itself employs a clever double hinge to lift it clear of the car for easy loading and gas struts on either side to support it. 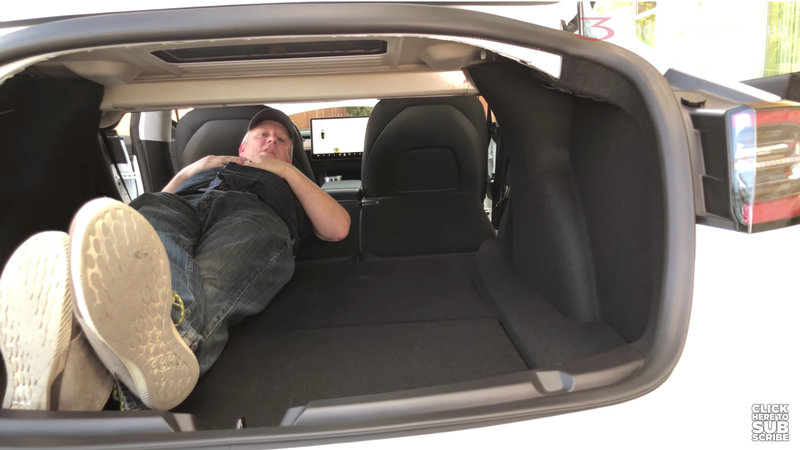 With the seatbacks down, Trevor was able to fit his 5’ 11” frame between the back of the front seats and the trunk lid, so Tesla camping is a definite possibility. 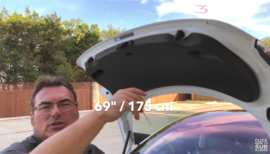 At the 16:15 mark, the video focuses on the frunk, which measures 34 inches wide, 18 inches deep, and about 10 inches high. Trevor notes that it seems big enough to handle a typical airline carry-on bag. Also inside the frunk is a tow hook for use in emergencies. It threads into a receiver hidden behind a cover built into the front bumper cover. For those who live in states or countries that require a front license plate, Tesla provides a plastic panel that comes with special adhesive tape from 3M. Peel and stick it to the front of the car, wait 30 seconds, attach the plate to the predrilled holes, and you’re good to go. The charging port for the Model 3 (@19:27) is hidden behind the side clearance light at the left rear corner of the car. It opens and closes from the key fob or via an app and will close itself about 30 seconds after the charging cable is removed. Next, Trevor and Ken turn their attention (@20:00) to the soft covers that hide the lug nuts. The spring-loaded items pop off and on easily. The bolt pattern of the wheels is 5 X 115 mm. At 20:45, the boys film the underside of the car, which is remarkably free of protrusions and obstructions in order to smooth airflow under the vehicle for maximum aero efficiency. 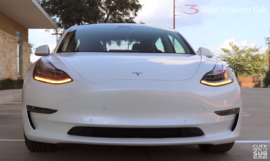 That’s it for Part 1 of the Model 3 Owners Club video reveal. Next up, Kyle will take you for a guided tour of the the interior and the magical touchscreen that defines the inside appearance of the Model 3. Take it away, Kyle!